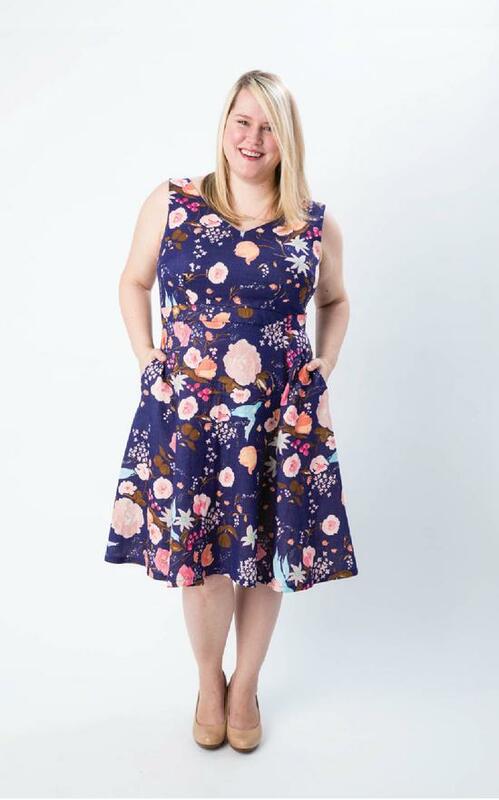 Everyone’s BODY shape has its own silhouette attributes that it's good to know when you're sewing and making your own clothes. Knowing your shape will help you to get a good fit but also make the most of your shape so you look pretty good too! Learn to balance your silhouette and choose styles to sew that suit it! WHAT SHAPES MATCHES YOUR SILHOUETTE? I carry my weight/fullness around the tummy area? Round silhouettes need to follow the line of their body and avoid adding any fussy detail around bust, tummy and hips. Detail should be above the bust and below the hip line. Garments should be slightly straight or fitted and fabric soft to avoid creating bulk around bust, tummy and hips. Apples should pay attention to both front and side view. Always keep garments fitted under the bust and avoid styles that finish at the fullest point and have excessive fabric in the middle section. Coats – Select coats single breasted and a single button positioned under the bust and above the tummy. Lapels are good. Skirts - The best length for you is just above the knee. Tops - Necklines need to be low and wide like scoop, square, ‘V’ neck or sweetheart. Shoulder pads are a good idea as they help garments drape from the shoulders. Make sure you've a well fitting bra. Blouses should have simple lines and opt for side and back zips and fastenings. Trousers – Select flat-fronted, wide-legged that don’t cling to the body. Choose trousers that fasten at the side or back. Dark coloured boot cut jeans are best for your shape. Don’t choose high waist jeans. If you are classic feminine hourglass shape – you need to wear make clothes that are shaped, fitted and defined to show off these lines. With your shape you can wear most styles of garment but make sure that whatever you're making is always fitted or has a belt. Dress/Coats – Show off that waist! Make sure it's fitted or semi fitted. Empire-line dresses are excellent and those with structure with darts. Wear belts both wide and thin to draw attention to the smallest part of your body. Skirts – You can choose straight, ‘A’ line, pencil, dropped waist, bias cut, pleated and full skirts. Trousers – All styles will work right through from wide-legged to ankle-skimming straight-legged. Always make jeans with a waistband. My hips and bottom are straight? Tops – Any style must fit you around the bust. Choose empire line that separates waist from hip area. Use ruffles and frills to add texture and volume (and femininity). Tops should be short to medium in length. Skirts – Select cross-over, panelled, ‘A’ line and straight skirts and wear with medium to wide belts. Add embellishment. Tops - Layer and embellish tops to draw the eye upwards. Tops and blouses should finish above the widest point of your hips. Make a fuss on top and keep the bottom half simple. Wear fitted blouses and tops with a fitted waist such as empire line, wrap-over, waistcoats, straight yoke, breast pockets, large collars and structured waistlines. Add shoulder pads or sleeves that add volume like puff, cap. Wear boleros and shrugs to cover up tops of arms. Trousers - Avoid wearing trousers with too much detailing such as turn-ups, pleats or wide-legged trousers and avoid pockets on the hip area. Flat fronted, bootleg are the best choices with no belt loops, creases, pleats, pockets. Skirts – Stay away from mini (however good your legs may be), dropped waist or panelled skirts. Choose straight knee-length or mid calf-length pencil, ‘A’ line and wrap skirts. Bias cut is good too. Coat/jackets – Choose a longer line coat with detailing such as on a trench coat. Double-breasted is a good choice for this shape. You need to wear and make clothes that make your hips look wider to balance out your top half. Skirt – ‘A’ line or straight skirts with volume such as tiers, dropped waistline, panels, box pleats are good choices. Most length skirts will suit you. Jacket – Choose a straight line or flared jacket with vents, lower pockets and a full hemline. Coat - Select a longline coat that tapers towards the hemline and has hip pockets. Dress – Straight lines suit you best such as the shift or ‘A’ line with tiers, pleats and patterns. Trousers – Select patterns with detailing such as back pockets, use pattern fabric, turn-ups, combat trousers, wide-legged, Palazzo, flares and culottes. Boyfriend styled jeans are perfect and in other styles, choose coloured-denim or add big pockets.